Pericoronitis is a common problem that occurs around a partially impacted lower wisdom tooth. 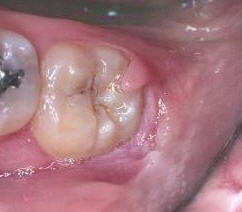 The literal definition of pericoronitis is inflammation around the crown. A piece of gum tissue appears over the biting surface of the tooth, which is very difficult to clean. Debris collects under the flap and, when the debris is not removed, the gum becomes inflamed. The gum can also become inflamed if the top tooth catches the flap of tissue during chewing. In most cases pericoronitis is treated with an antibiotic for a few days and when the infection has decreased, the wisdom tooth is removed.